Fit Foodie Megha: Truffles Festival – explore the unknown at Bene, Le Meridien, soon to be Sheraton Grand, Pune — Reviewed! Truffles Festival – explore the unknown at Bene, Le Meridien, soon to be Sheraton Grand, Pune — Reviewed! Lesser do we know about Truffles! What is the first thing that comes your mind, when you hear 'Truffles'? Well, for me, its truffle oil. Truffles are one of the most expensive food in the world as it is hard to farm them. They need specific kind of soil and climate and grown in tree roots and later sniffed out by pigs or dogs. Truffles can't be planted or cultivated; its a wild, natural product. How do I know all this? 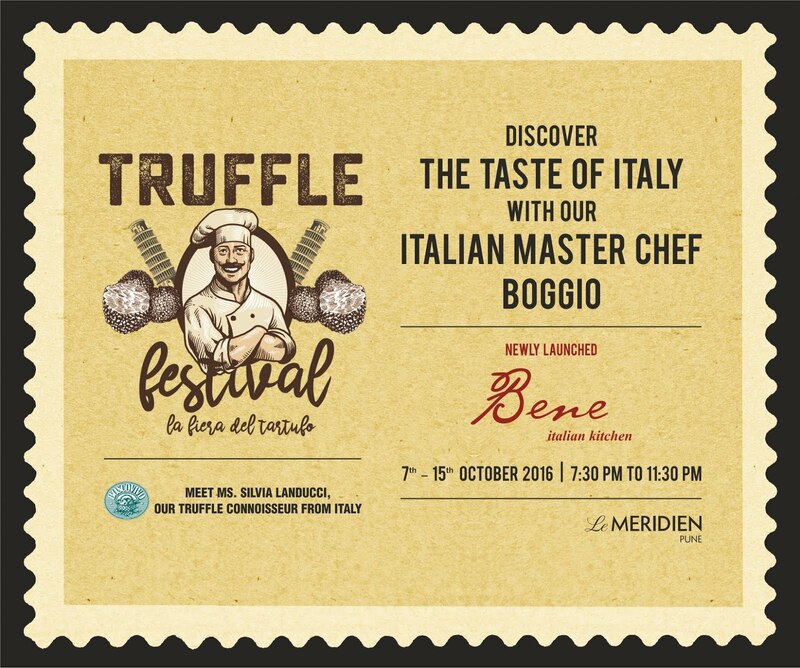 Well, to educate people about 'diamond of the kitchen' or truffles, Bene, the newly launched Italian restaurant at Le Meridien Pune (soon to be Sheraton Grand) has come up with the Truffles Festival. 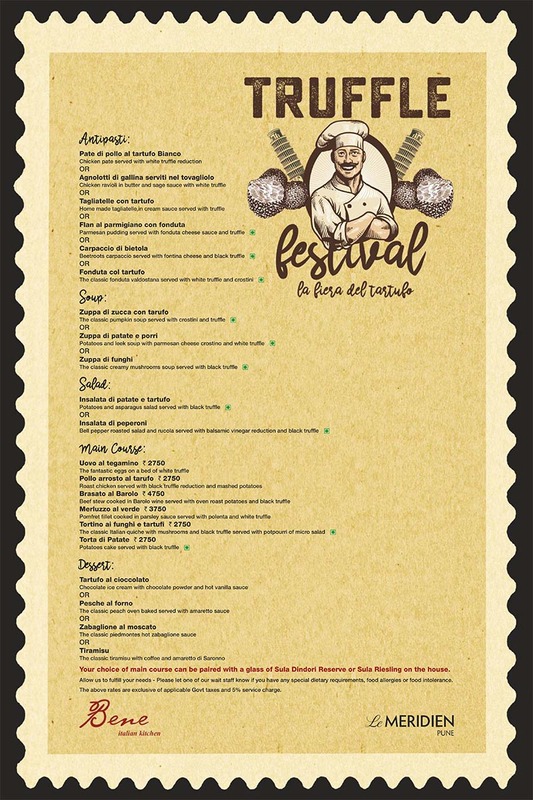 The festival will witness Italy’s most refined delicacies delectably crafted with exotic truffles prepared by Chef Roberto Boggio and his team. We were invited for the preview of the festival, Italian truffle expert Silvia Landucci was there then to educate us about the long history of truffles. It was a fun evening to talk with an expert who have truffle cultivation as a business. Chef Roberto, pretty excitingly had chat with us, and then we moved for the dinner. Started with the Antipasti or starters, creamy Tagliatelle with veggies served with truffle. Tagliatelle was fresh, homemade and super delicious. Loved it! Zuppa di patate e porri, or Potato and Leek Soup was just WOW! Thick soup with truffle aroma, buttery texture, full of flavours. Filling soup! Main course had Torta de patate, a potato preparation, looked like a potato lasagne, was served with boiled vegetables and awesomely tasty mashed potatoes with some black truffles. Our evening ended on a sweet note with Pesche Al Forno, a peach cake served with amariotto sauce. Icing on the cake is, you can pair your meal with a glass of Sula Dinodri reserve or Sula Riesling to make your evenings enjoyable and memorable. So, people head on the Italian speciality restaurant, Bene for some delectable meal. The cost printed in front of the main course is inclusive of the four course meal and a glass of wine.